Evobet was established in 2018. The owner is CW Marketing B.V. Casinos. Evobet is a new NetEntcasino for us so we gladly took a closer look at it. The design is okay and quite colorful. Under new games in the casino section we only found one new NetEnt game, Turn Your Fortune. Under the category top slots you can play an entertaining NetEnt game called Jimi Hendrix from NetEnt. The game has lovely cartoon graphic and of course great rock and roll sound. There are plenty of good slots at the casino. You can enjoy great NetEnt slots such as Butterfly Staxx, Fairy Tale Legends Hansel & Gretel, Fairy Tale Legends Red Riding Hood, Emoji Planet, Finn and the Swirly Spin, Wolf Cub, Warlords, Wild Wild West, Vikings, Gonzo’s Quest and Starburst at Evobet. There is a good Live Casino section with Blackjack, Roulette, Baccarat and many other classic live games. The Live games are from four different developers, NetEnt, Ezugi, Lucky Streak and Betconstruct. Since one of the developers is Evolution you can enjoy the exciting game Lightning Roulette, which has many special effects. This casino has a lot of different kind of games to choose between. It’s possible to play Lottery Games, Scratch Games, Video Poker and something you have to try called Virtual betting. The Lottery games section only consists of one game but the Video Poker section is quite extensive. In Virtual Betting you can bet on dogs, horses, dices, rugby, soccer, African cup and much more. The sportsbook offers betting on chess, cricket, cycling, darts, bandy, beach football, politics, tv shows & movies, Oscar, Eurovision, Champions League, Bundesliga and many more. You can actually bet on sports from all over the world. Some of the sporting events come with live-streaming, that is something we appreciate. There is a decent promotions page you can find some promotions for Sportsbook and casino! Evobet has virtual betting, e-sports, live casino, sportsbook, casino, scratch games, video poker and lottery games. That is a lot of features,“under the same roof”. The sportsbook is quite mighty and extensive and the casino has plenty of good games. Evobet offers a great gaming experience for both casino enthusiasts and sports bettors. There is a welcome bonus on 100% that you can play NetEnt games with, have fun! 1. You are entitled to just ONE Welcome Casino Bonus and ONLY with your first deposit. 2. 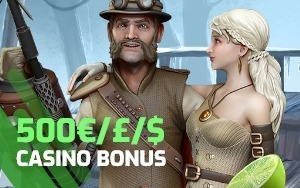 Make your first deposit and you are eligible for a 100% Welcome Casino Bonus up to 500€/£/$. 3. Before making a deposit, you must claim the Welcome Casino Bonus. After claiming the bonus, and making the deposit, the bonus will be awarded automatically to your account. 4.The minimum required deposit to get the Bonus is 30€/£/$ or equivalent currency. 5. The Welcome Casino Bonus can only be used on Casino Slots of the following providers: Netent, Play’n Go, Red Tiger, 1X2gaming, Pari Play, Playson, NextGen Gaming, ELK Studios, Casino Technology and Cryptologic. 7. Both Bonus and Deposit amounts need to be wagered forty (40) times. Sign up here and have a great time!